This print is trimmed to the image. If it wasn't it would show the publisher on the left margin. The publisher was Sagamiya Tōkichi (Marks 435 - seal 24-009), aka Aito. Its seal can be seen on the example in Boston. 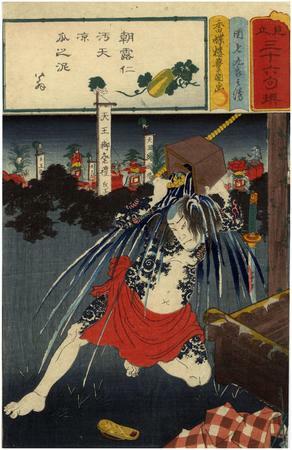 Although the inset image at the top of this print is not signed it is most probably Miyagi Gengyo. Other insets in this series, which are consistent in their design, are signed by that artist.